This is so true. When I am sick, I am consumed with thoughts of getting better. The illness imposes restrictions on me and my quality of life is reduced. I tend to be grateful everyday for the health of my loved ones. I need to remember to be grateful for my own health. 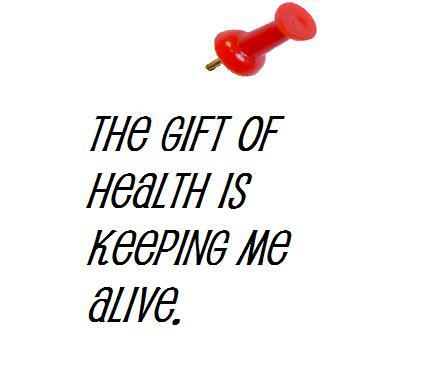 Today's assignment is to be grateful for my health. Thank you for my legs and feet because they are my main form of transportation in my life. I use them stand up, sit down, exercise, dance, climb stairs, drive my car, and walk. My legs give me freedom to enjoy life. Thank you for my arms, hands and fingers because they are the major tools in my life and I use them nonstop all day long, every day. They allow me to write, eat a meal, use a phone or computer, shower, get dressed and do everything for myself. Thank you for my amazing sense of smell because it enables me to experience the beautiful fragrances of life: flowers, perfumes, clean sheets, dinner as it's cooking, a fire burning, the on a summer's day, freshly cut grass. Thank you for my precious sense of touch because it enables me to feel objects or physically express love or receive it. Thank you for my eyes that enable me see everything. My eyes enable me to see the faces of my loved one and friends, read printed books, newspapers and emails, watch television, see the beauty of nature and most importantly, see my way through life. Thank you for my hearing because it enables me to hear my own voice and other people's voices so I can talk to people. It enables me to use a phone, hear music, listen to the radio, hear my loved ones and the sounds of the world around me. Thank you for my brain and beautiful mind. It processes over a million messages a second received by senses. It enables me to sense and experience life. Thank you for my organs because they sustain my life by continuously filtering, cleaning, and renewing. Thank you for my strong and healthy heart because it keeps the life flowing to every system in my body. After reviewing my gratitude list from today I decided I am most grateful for My Mom because she came to my home as usual on a week day to take care of her Great Granddaughters and her baby - me. I love my Mom so very much. Thank you, thank you, thank you. Okay, as you see the stone is still not painted. I am now thinking I should just get a new stone because this one is a bit too big. Tomorrow is another day. Nicole for spending time with me. Thank you, thank you, thank you. Money because I was able to purchase clothes for Faith and Sidney. (It will be Faith's first day of school. Sidney will be starting senior kindergarten.) Thank you, thank you, thank you. The sub I had for supper today because it not only stopped the hunger pangs, it was also delicious. Thank you, thank you, thank you. My car for transporting me every where I wanted to go today. Thank you, thank you, thank you. Nicole's laptop so I could post today. Thank you, thank you, thank you. My own copy of The Magic because it will be easier now to read it and reread it. (Nicole found it for me at a really good price.) Thank you, thank you, thank you. The cold free flowing water from the garden hose because I was able to quench my plants thirst, my granddaughters could play and I could cool myself down. Thank you, thank you, thank you. The food in my refrigerator and cupboards because I was able to just reach in and grab breakfast for myself and my two granddaughters. Thank you, thank you, thank you. My granddaughters because I can't help but feel happy when I look at them. Thank you, thank you, thank you. The hugs and kisses and the "I love you" I get everyday from my granddaughters. Thank you, thank you, thank you. I found it easy to be grateful for my health today. In my forty something years on this planet I have had three surgeries, a broken ankle, numerous bouts of the flu, bronchitis, muscle spasms, excruciating headaches, sinus infections etc. Every day that I am pain free is a good day. I am still finding it difficult to come up with ten things to be grateful for each day. I shouldn't because I do have so much to be grateful for. Again time flies way too fast. 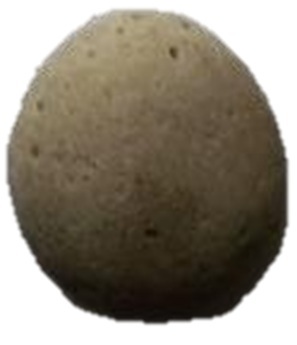 I am going up to bed, pick up my gratitude rock and figure out what I have to be most grateful for today. 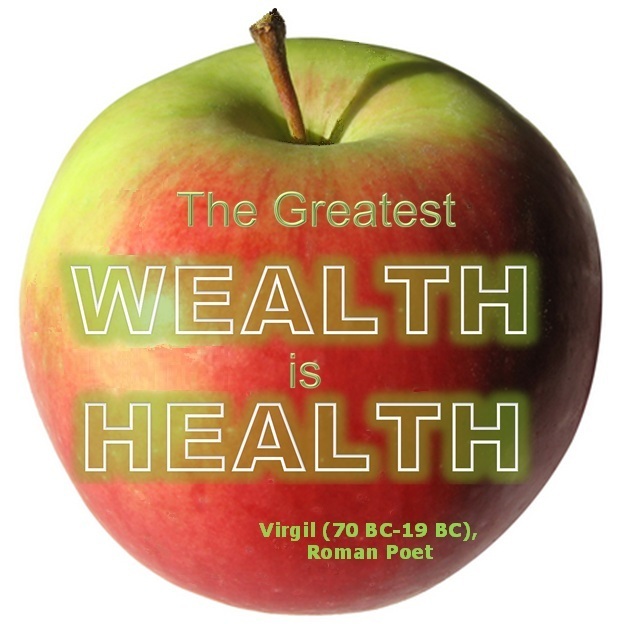 Do you take your good health for granted? Or are you grateful each and every day? Just jot down your thoughts in the comment section. Tomorrow is Day 5: Magic Money .